The focus for the wider Caribbean, leading up to Christmas, was on the devastating effect of the most recent hurricanes and storms in various parts of the region. The British Virgin Islands and the French West Indies in particular were severely affected and are, to a varying degree, still in recovery mode. 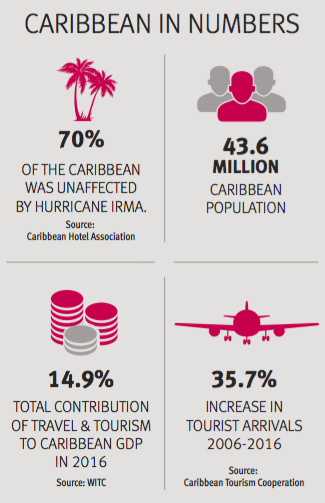 It is worth being aware that 70% of the Caribbean was untouched by the storms and for the likes of southern lying Caribbean islands like Barbados they are positioned outside of the ‘hurricane belt’, so much less prone to extreme weather. The performance of the Caribbean’s prime residential market varies significantly from island to island. In recent years momentum has been firmly focused on the island of Mustique, the Bahamas (in particular New Providence and Paradise Island) and prior to Hurricane Irma, St Barts. These islands have all recorded strong sales activity, the only constraining factor being their lack of inventory. Elsewhere, the BVI and Barbados have experienced weaker market sentiment. the most affordable it has been for probably 10 years. For owners in Barbados, many of whom have owned properties for well over a decade, and in London and other established economies, values have risen and fallen as they do anywhere. Differently to a decade ago, today the markets are more fluid, driven primarily by political and fiscal uncertainty. For Barbados, prices particularly on the West Coast went through an upwards trend from 2008, and then in recent years have experienced a natural price correction. Today, if sellers want to do deals this season, they must ensure pricing is attractive and justifiable. Buyers today want comparables and market evidence to support pricing. They want the track record of highly professional agents like Terra Luxury | Knight Frank. The headline for this season is that for anyone who has been considering buying on the island, Barbados is the most affordable it has been for probably 10 years. When advising any of my clients on buying a home in the Caribbean we usually start with what their dreams and aspirations are and then travel through the region discussing the islands, the types of properties available and the lifestyle benefits. With friendly locals, one of the best all year around climates (closer to the equator and further south than most), restaurants, shops, bars, wildlife, history, cricket, polo, golf, horse racing, houses, apartments, sea view, golf view, polo view - this is why I always describe Barbados as the ‘Swiss army knife’ of Caribbean islands. In all of the Caribbean, there is a bit of a generational ‘changing of the guard’ taking place. With many long term owners now selling they are being replaced by a new generation. Albeit a new generation that still wants what Barbados has always been famous for, but also thinking about Barbados needing to be attractive for their children and any younger family or friends. The island has seen this need most strongly in recent years, and thankfully is adapting and you can see it in the type of investment now coming to the island. A gap in the market is now being filled for a more active and fun beach scene for a slightly younger generation - often the children of current owners. New beach bars and restaurants have opened, and in particular, the big brand of Nikki Beach has been a roaring success, bringing a much more glamorous and fun feel to the island that you might find in Ibiza, or St Tropez and closer to home, in St. Barts. Combining the above with the market and prices at the turn of a low point, the smart money will start coming back to Barbados. If a client was looking to invest in an island that is adapting for the better, for the future, Barbados must command attention. Barbados is moving in a new direction for the future and there has never been a better moment to buy.